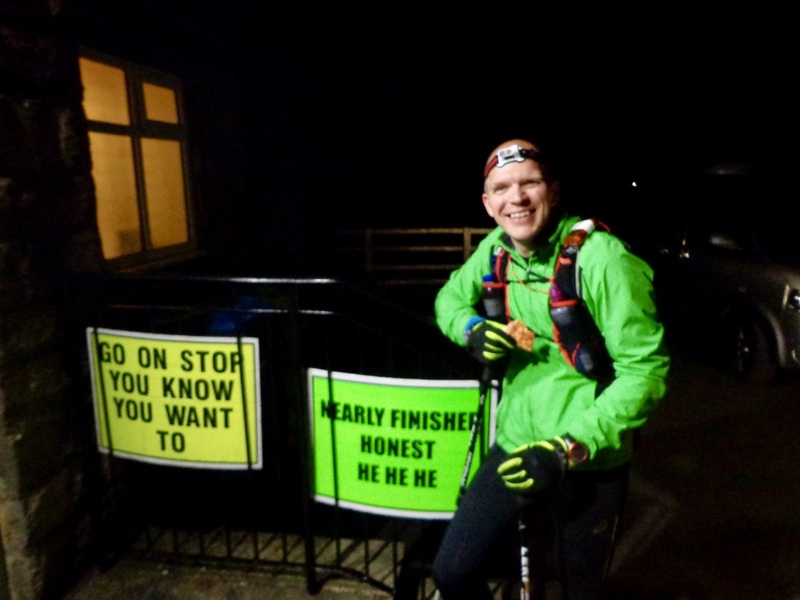 “Don’t you dare sit down,” barked my support runner Gary Thwaites as we reached the final checkpoint at the White Horse in Kilburn. It was too late; I’d seen the chair and was in it before he’d finished the sentence. I’d come so far, it was so hot and I just needed a few minutes to regroup. I was miles behind my planned race times but knew I was still on track to finish comfortably within the 36hrs cut-off. I’d passed the magical 100-mile mark (102 miles with 10 more to go). White Horse was a moment to reflect. I knew that this was the final stretch of a plan dating back years. I’d always thought of this moment from my first foray into the world of ultras, and in particular, Hardmoors ultras. This was the race that I wanted but couldn’t get into my head the mentality needed to enter it. I’ve so much respect for everyone who attempts it – whether they enjoy success or fail – they put themselves on the line. 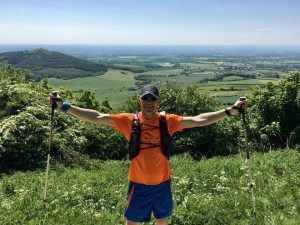 After years of running the Hardmoors 55 and 60 races, it was time for me to finally take on the challenge. 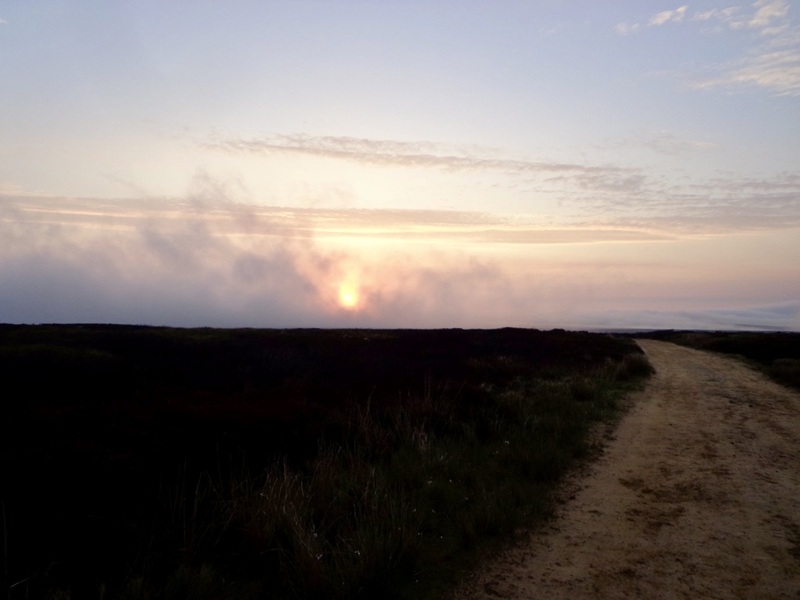 Last year’s West Highland Way reduced my fear of the distance but at 16 miles longer, the Hardmoors 110 would represent and much sterner challenge. Like all best-laid plans, training went a bit astray from March onwards. I was still putting the miles in but life had dealt me a crap hand, which left me with very little spare time to focus fully on the training I’d planned. However, after all the months of training and planning, the day finally arrived. I’d arranged a crack support crew of Gary Thwaites from the start in Filey to Saltburn, where he would hand over to the O’Neill gang for the night shift who would then hand back over to Gary and my wife from Osmotherley the next morning. All my kit, food and drink supplies were packed neatly into boxes in the car, route instructions and a loose timetable were drawn up so all that was left was for me to get on the start line and fulfil my destiny (or dream, or madness). The morning was cool and fresh, almost perfect for running as we gathered on Filey Brigg awaiting the countdown from Jon Steele. At 8:03 am we were off. I found myself, as I did at the Hardmoors 55, among the front-runners, so quickly found a space on the grass verge and let the faster runners stream past. There was a long way to go, so I didn’t want to get carried away. The miles ticked by, and I chatted to a few people including James Campbell who looked in good shape and was plodding along at a good pace. The first few miles gently rolled by towards Scarborough before dropping onto the seafront for around 2 miles of flat running to Scalby. Here I met Gary once more to fill bottles and grab some food before heading off for the long stretch to Ravenscar, the first major checkpoint. I was enjoying the views looking north up the coast and yo-yoed with several groups of people along the way. The temperature was starting to rise slightly but I was fine with what I was wearing. The route drops into Hayburn Wyke where a diversion was in place following landslip earlier in the year. The diverted route, while a little longer, cut out the steep climbs and was a joy to run. It reminded me of Castle Eden Dene. At Ravenscar the route heads up the hill to the village hall where the checkpoint was buzzing with runners and support crews. I took my time here to apply a liberal coating of Vaseline to my feet, which were starting to swell and rub in my shoes. I also took a bit of food and drink here but knew Gary was just down the road with my own supplies, so didn’t stay long. On the way back to the Cleveland Way I passed Gary and grabbed a bit more food and refilled my bottles before setting off for Robin Hoods Bay. This is a relatively short section and takes in some of the best parts of the route for views and little gems like Boggle Hole before dropping into Robin Hoods Bay. It was on this stretch that I caught up with Lyndsey Van Der Blyth who was running the Hardmoors 160. She was smiley and chatty and seemed to completely defy the fact that she’d been running since the previous evening having set off from Sutton Bank along with 16 others. We chatted as we made our way up the steep road to the top of the bay and I felt inspired as we parted when I met Gary once more for a quick restock of fuel and drinks. The next section gently rolled by towards Whitby. The temperature was starting to rise still and a pop-up water stop at Saltwick Bay caravan park was a welcome relief with its ice-cold water on offer. Onwards I pushed into Whitby, which was as busy as ever. I ran down the 199 steps with no real problems and into the narrow street where everyone came to a halt. Someone had decided to park their car in the middle of the road and so no one could get past. After a few minutes of pushing and shoving I managed to break through only to turn onto the main road and find the bridge was closed to allow boats through. Once again I was held in the crowds and had to fight my way through once the bridge had reopened. 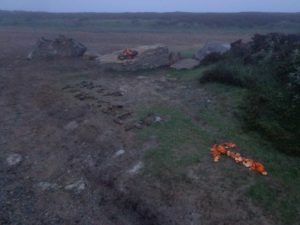 I made my way up past the Whale Bones where I heard the cheery voice of Dave Robson who was supporting another runner and then onwards to Sandsend for the next checkpoint at 36 miles. Here I took a bit of time to refuel and use the toilets before pressing on. From here the climbs up the cliffs get steeper and longer and start to take their toll on weary bodies but I still felt comfortable and was just about on target for times. The next section rolled by to Runswick Bay but the climb down to the beach and back up to the checkpoint at the top of the car park is cruel. I pressed on to the next point of interest – Staithes. I was starting to feel a little ropey by the time I reached this lovely little fishing village and I met Gary who ran on ahead to the car to get some food and drinks prepared, along with a warm top as it was getting cooler on the cliffs. As I made my way up the final hill out of Staithes it happened. I was sick. I have a real problem with sickness in long races and it was back. I met Gary feeling really sorry for myself and doubts had started creeping into my mind as to whether I could do this now. But I pushed on, the next section to Saltburn being rather tough taking in some of the highest east-facing cliffs in the UK. I was sick a few more times but managed to keep moving at a fairly steady pace. My legs and body felt generally fine, I was just struggling to keep food and drink down. I arrived in Saltburn around an hour behind my planned time but I wasn’t too worried about that. Here was where Gary would depart and the O’Neill’s would take over. It was great to see them and I spent a bit of time getting changed into clothes for the overnight section. I had some chips and a cup of tea, which were a struggle to get down but hit the spot. Jen had decided to run with me from here to Slapeworth so we set off up the hill. I was feeling refreshed and revived at having changed and picking up the company but that all changed in an instant when I found myself back on my hands and knees being sick once more. The next few miles to Slapeworth were a drag and I was feeling really low. At Slapeworth the crew was waiting once more, I was feeling dispirited but knew I had to keep going. I saw my poles by the side of the car so decided to take them. I think they would become my comfort blanket for the rest of the race. Jen was stopping here so that she could run the next section from Gribdale to Clay Bank so off I went on my own into the darkness of Guisborough Woods. I know this section relatively well but the darkness coupled with a thick fog meant you could see no further than a few meters which made this a very difficult section. I was confident I knew where I was until I spotted a sign pointing down to the Tees Link footpath. I immediately cursed myself knowing I’d taken a wrong turn somewhere and that meant a stiff climb back up to High Cliff Nab to get back on track. Back on the right path, I made my way towards Roseberry Topping, for the out and back. It was a tough climb up and at least 10 people were on their way back down as I made my way up. I got the top where the marshal was buried deep inside a tent, which was being battered by the cold constant wind. I shouted my number and made a hasty retreat off. I made my way to Gribdale where my crew were waiting for me. It had taken me a lot longer than expected but I was feeling much better now. Jen was ready to run so after a bit of a rest we set off up to Captain Cooks Monument and towards Kildale which we reached at around 2:50 am, about an hour and fifty minutes behind schedule but well within the cut-offs. Kildale is a little oasis in these races, be it on the 110 or the 55, and Sue Jennings was there to welcome us in. I made the effort to have something to eat, pizza being the food of choice here, and took time to plaster Vaseline on my feet once more. It really was helping. After nearly 20 minutes we set off for what is a mind-numbing section towards Bloworth Crossing. We made good steady progress up what is a long arduous climb on a bleak road to, well, nowhere! Marching, chatting, one foot in front of the other was the order of the day on this long section. Eventually, the track levels out as you reach the high point. Along this section, we caught up with two guys who were running the 160 race together. They looked strong and again gave me a lift from their spirit and determination. 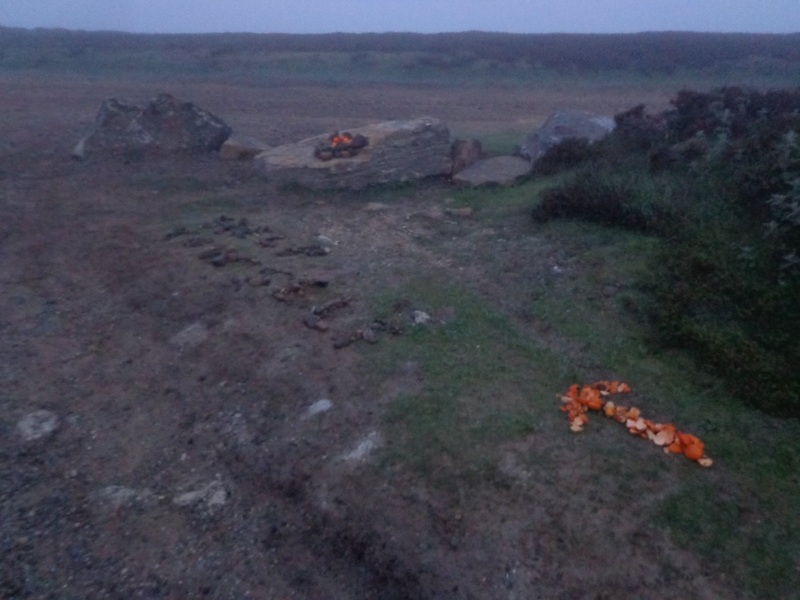 As we headed towards Bloworth Jen noticed a pile of orange peels shaped into an arrow, then the words ‘Help yourself’ spelt out in stone to which someone had left a pile of oranges on a big rock. It’s little things like this that really do make you smile and the efforts that people go through to give you a bit of comfort never ceases to amaze me. Onwards and upwards, we finally reached Bloworth Crossing and in the distance, to the east the sun was starting to rise which was showing us how beautiful it can be up here. I felt privileged to be running in such on such a beautiful morning in good company but also knew I had a long way to go and had better put a bit of pace into my legs. Eventually, I reached Clay Bank at 5:41 am, 79 miles in. 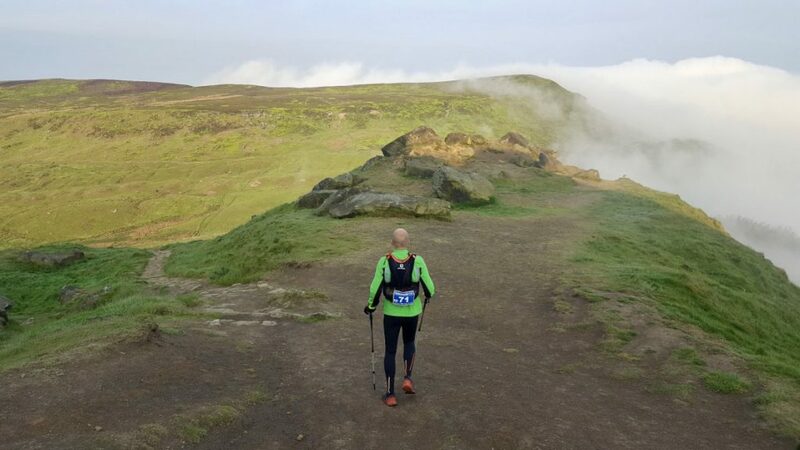 This is the start of probably the toughest section of the race over the ‘Three Sisters’, which include Wainstones. These were tough climbs but the views from the low hanging cloud and inversions took my mind of some of the pain. I was beginning to feel quite tired and was feeling the effects of a lack of food caused by my nausea. I passed through Lord Stones Country Park and headed up the final steep climb of this section to Carlton Bank before the long downhill into Scugdale. It was getting warm now as the sun began to rise further and from here it was the long, but a relatively straightforward drag to Osmotherley Square Corner. By the time I reached Osmotherley, the sun was beating down so I sent Jen to the shop for an ice-lolly. This lifted my spirits for a bit but I struggled on the final climb to Square Corner where my wife and daughter were waiting with Gary to take over for the final section. It was such a relief to get there. I was now 3hrs down on my plan but I didn’t care at all. This was 90 miles and I knew I had only 22 miles left to finish. My legs felt good but my depleted energy levels and the rising heat were starting to get to me. After changing into a light t-shirt and shorts I said good-bye to the O’Neill’s and to Jen and set off on the final stretch with Gary who would run the last bit with me whilst my wife took up crew duties. Gary, for all his efforts, had probably the worst job of the day trying to keep me motivated over the 9 or so miles to the White Horse. He was patient with me as I huffed and puffed and generally ignored everything he said and ask me to do over this part of the race. (Sorry Gary). Eventually, I reached Sutton Bank where my wife was waiting with the sun cream, which I so desperately needed now as the sun beat down on my exposed skin. I had all but 10 miles to go. I knew I had it done now, I knew I was going to finish, the question was, how quickly could Gary get me to the end? The final part of the race is a meander through farms and villages on the way to Helmsley. Very easy running normally but I was happy to just keep plodding until finally, the castle appeared on the horizon. The final mile wormed its way into the village; I took a moment to touch the Cleveland Way marker (finally I’d conquered it), before making my way to the finish at the sports club. My daughter was there at the end but she quite clearly couldn’t decide if playing on the swings with her new found friends was more important than running the final few meters with me –typical! After 34hr02mins, I crossed the finish line. It was the moment I’d waited for. It hadn’t gone the way I’d hoped, there’d been lots of ups and downs – quite literally – but I’d finished the race and at that point, my legs gave up and I lay on the ground in a warm glow of pride and muttered ‘never again’ (maybe! ).